Law students from various parts of the country are taking part in this internship. 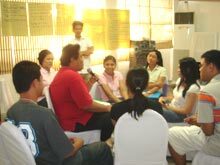 Through the program, freshman and sophomore law students from schools such as the University of St. La Salle – Bacolod City, University of St. Agustin – Iloilo City and Ateneo de Manila University are immersed in far-flung communities and given first hand experiences in alternative lawyering as they help address human rights issues of the poor and marginalized. At the end of the program, interns are expected to replicate the program in their own schools. “FNF supports the internship program because we believe in its ability to transform lives -- not only for interns but also for those of the people they interact with. We see this as a contribution to inspire change through initiating awareness on human rights,” said FNF Senior Administrative Officer Minnie Salao at the opening of the seminar. 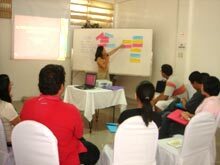 The Basic Orientation Seminar not only introduced the interns to the program, but was also a forum where interns debated on the universality of human rights and discussed the human rights situation in the Philippines.